Edward Ahart ’69, chair of the Board of Trustees, recognized Barbara Levy ’77 as the recipient of the Lafayette Medal for Distinguished Service during the 181st Commencement Saturday, May 21. Commissioned by the board in 1987, the Lafayette Medal is the College’s premier award for volunteers, given to those who have a demonstrated record of voluntary service in a variety of areas with noteworthy achievement in each. Levy is the eleventh recipient. Levy serves as vice chair of the $400 million Live Connected, Lead Change campaign, and is a member of the Executive Committee. She also serves on the Committee on Compensation and the Committee on Development, Alumni, and Community Relations. Her record of service to Lafayette is long and distinguished. A member of the Board of Trustees since 1998, she served as co-chair of the committee on Athletics and Student Affairs and chair of the ad-hoc committee on Religious Life. She served as co-chair of the working group on Greek Life and Campus Community. She was also chair of the 2013 Presidential Inauguration Steering Committee. She has been a member of the Council of Lafayette Women, the Lafayette Leadership Council, a mentor through the Gateway program, a participant in the Lafayette Leadership Institute, alumni president of the Class of 1977, an alumni phonathon volunteer, class reunion chairperson, a member of the ad-hoc committee that reviewed space needs for the Psychology Department, an externship sponsor, and a representative to the Class Alumni Council and Alumni Council Executive Committee. She is a member of the Fleck Society for consistent giving and in 2014 received the Joseph E. Bell ’28 Award for distinguished service to the College. She is also the recipient of the George T. Woodring ’19 Volunteer of the Year Award and the first recipient of the Daniel H. Weiss Award for Leadership and Vision. Levy and her husband, Joseph Hollander, have two daughters, Rachel Hollander ’11 and Alyssa Hollander ’14. In 2007, Levy retired after 30 years in the retail industry as executive vice president of merchandising for Ross Stores, Inc. In her role, Levy was responsible for buying from and negotiating with over 1,000 active vendors on behalf of 700 stores. She is active in the community and does consulting work for the retail/merchandising industry. She is currently the treasurer of the Board of Trustees at Temple Beth Ahm in Aberdeen, N.J., and a devoted mentor for students at Asbury Park High School since 2008. In 2010, Levy joined the Board of Trustees of Chhange (Center for Holocaust, Human Rights and Genocide) at Brookdale Community College. She graduated from Lafayette with a bachelor of arts degree in psychology. I second what Ellen says above. Well deserved recognition! I can’t think of anyone more deserving of this award. 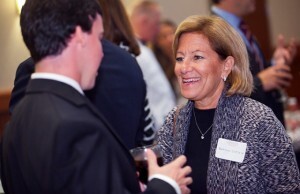 Barb truly embodies the Lafayette spirit and has served as a role model for both students and alumni. It has been a pleasure working with her and getting to know her through our service on the Council of Lafayette Women. Congratulations, Barb!